Germany is definitely, definitely going to the World Cup final. And Brazil, the tournament's host, is definitely not. 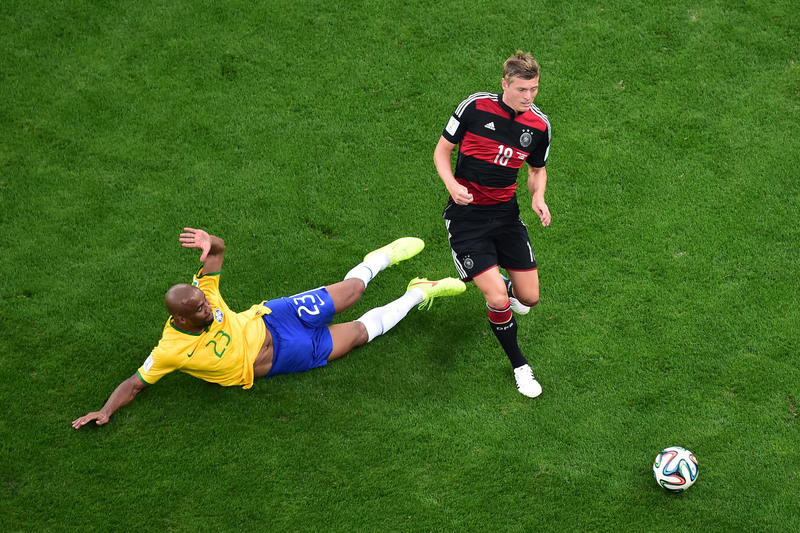 In the first 29 minutes of the Germany-Brazil game, Brazil was down 5-0 — a World Cup record-breaking figure. Those five goals were scored within 18 minutes, and two more were scored later. Brazil played the game without its star player, Neymar da Silva Santos Junior, which the team lost in a match against Colombia on July 4. They won the game and advanced, but Neymar was kneed in the back and fractured a vertebra. By the second half, Germany midfielder Toni Kroos had already scored two goals and was "looking for a hat trick" on the field, commentators said. Meanwhile, a forward for Germany, Miroslav Klose, became the all-time biggest scorer in World Cup history. Makes you feel a little bit better about the United States' loss to Germany in the group round, anyway. In the second half, Germany scored two more goals and Brazil scored 1, leaving the game at 7-1. According to New York Times reporter Sam Borden, Brazilian children are literally crying in the stands in Belo Horizonte right now. The loss was so intense that fans of Germany had to be escorted from the stadium for their own protection. "This could get a lot worse." "When is this goal-scoring going to end?" "Whenever they start defending." "Germany toying with Brazil, able to do most anything they please." "Who is marking anybody in this game? Because I have no idea." "This has been an appalling display." "Can't even believe it, can you? We can't, at half time." "This is embarrassing, isn’t it? This is a humiliation. At home, as well!" "You cannot underestimate how bad Brazil’s been today. It’s like amateur hour." "I keep saying appalling, 'cause there's not another word." "Well you and I are pinching ourselves! I think everybody here is!" "I must say, I’ll give a lot of credit to the crowd, they’re still here." "Brazil have just thrown in the towel!" "Oh, this towel was thrown in 40, 50 minutes ago." "For those of you just tuning in, that score is right." "Just get the feeling that on this day Brazil could play 'til midnight and it wouldn’t go in."